Growing up in Waterloo, Iowa, the hometown of Dan Gable, Mike Chapman’s life changed when he was 10 years old and his grandfather gave him a book called 100 Greatest Sports Heroes. In that book Chapman read about Frank Gotch, who grew up on a farm in Humboldt, Iowa, and in 1908 became the heavyweight wrestling champion of the world and the most popular athlete in America. Gotch become one of Chapman’s heroes and helped cement his love of wrestling. Mike went to East Waterloo (Iowa) High School, which had a great wrestling tradition, but he didn’t have the confidence to even try out for the team. Instead, he began lifting weights by himself in his basement. It was in the Navy where he also got his introduction to the newspaper business, which would become his professional career. Today, Mike Chapman is known as one of the world’s leading wrestling historians and as a man who has spent a great deal of time promoting wrestling. 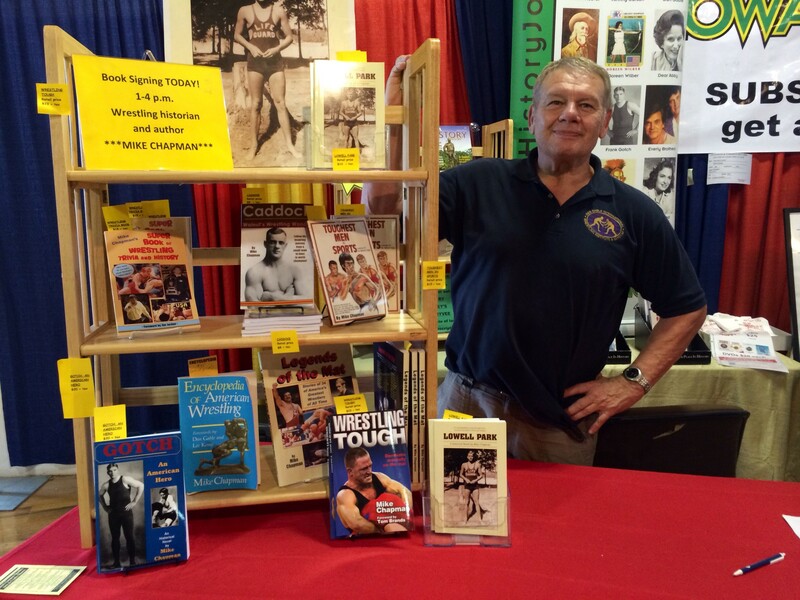 He has written 16 books about wrestling (and 27 books total); is the founder of the International Wrestling Institute and Museum (now called the Dan Gable Museum); and is the creator of WIN Magazine, the Dan Hodge Trophy, and the WIN memorabilia show. Chapman has attended 45 NCAA wrestling tournaments, two Olympics, and two World Championships, and has been named National Wrestling Writer of the Year five times. He has received the Order of Merit for lifetime achievement from the National Wrestling Hall of Fame, the Iowa Coaches President’s Award, and the Lifetime Achievement Award from the Cauliflower Alley Club (CAC, a group of wrestlers, boxers and show business people). He is a member of eight halls of fame, including the National AAU Wrestling Hall of Fame. Besides wrestling in the Navy, Chapman competed in judo, sombo and bench press contests. Wrestling Stories recently caught up with Chapman to learn about his career path and some of the most memorable moments he has witnessed in wrestling. Wrestling Stories: How did you get started as a writer? Mike Chapman: When I joined the Navy I was literally chipping paint on a ship, but after I tried out for the wrestling team and made it, they didn’t want me wasting energy by chipping paint so I was assigned to the ship’s newspaper instead. After discharge from the Navy, I was going to attend the University of Iowa and wrestle there, but I cut my index finger off in an accident and I dropped out of school until the hand healed. I needed to make some money so I applied for a job at a small Iowa newspaper and got it. I ended up really liking the work so I stayed in the industry for 35 years. Once I was in the newspaper business, I made it my mission to write a great deal about wrestling since I always believed the sport was under represented. WS: How did this lead you to write your first book? MC: When I was 33 years old I decided I wanted to write a book about Dan Gable, who had just gotten back from the 1972 Olympics in Munich and was the talk of the wrestling world. [Editor’s note: Chapman is five years older than Gable and both grew up in Waterloo, Iowa]. However, someone else had just written a book about Gable, so because I idolized Dan Hodge, I decided to write a book called Two Guys Named Dan. I called up Dan Hodge and convinced him to let me interview him and then I found a publisher to purchase the manuscript. Many months later I got a package in the mail with 10 copies of the book and was amazed to see my name on the cover as the author. WS: And so it was your positive experience writing the first book that led you to continue? MC: Yes. First, I noticed that there was a huge void in the marketplace for wrestling books; there were never any books on wrestling in the sports section of the bookstores that I visited, even though there would be books on every other sport possible. It always bothered me that wrestling got so little publicity. After selling my first book, I got a nice rush of excitement and a nice check, and at this point I was raising a family and needed extra money, so I started freelance writing and continued to write books as a way to earn income on the side. My mission has always been to bring wrestling to a greater audience, and my bestselling book early on was From Gotch to Gable, a that book started from a three-part newspaper series I wrote about how wrestling became popular in Iowa. Back in high school, I never dreamed I would write even one book and today I’ve written 27. The key is that I am passionate about the topics I cover and I do my research. It’s all about discipline — being disciplined enough to plow through the process and make it happen. Writing a book is not easy, but neither is wrestling. WS: You’ve mentioned that Frank Gotch is a hero of yours. Tell us more about Gotch and how you got interested in him. MC: Like I said, I first learned about Frank Gotch when I was 10 years old, and he became one of the people I admire most. I believe he was the greatest wrestler who ever lived, and he put wrestling on the map in Iowa and all of America. Gotch was born in 1878 in Humboldt, and grew up wrestling with the other farm boys. After Gotch beat George Hackenschmidt to win the world heavyweight championship in 1908, he became the most popular athlete in America and was invited to the White House by President Roosevelt. In 1911 when the two men had a rematch in Chicago at Comiskey Park, nearly 30,000 spectators showed up. Gotch was truly larger than life, and his death in 1917 from kidney failure was as tragic as his life had been glorious. The whole state of Iowa went into morning. As if that story wasn’t enough to make me fascinated by Gotch, I was also amazed how he inspired generations of Iowa wrestlers. When I interviewed the first three coaches from Iowa who won NCAA team championships (Paul Scott of Cornell College in 1947, Dave McCuskey of Iowa State Teachers College in 1950 and Harold Nichols of Iowa State University in 1965), they all said Frank Gotch was someone they looked up to when they were young men. WS: You’ve become a collector of Frank Gotch memorabilia. What items of his do you own? MC: As I am talking to you, I am sitting in Gotch’s favorite lounge chair, and I also have his wicker table here in my den, where I do all my writing. I own his old traveling trunk and his black derby hat. I used to own the shoes he wore when he wrestled Hackenschmidt, but they are now in the Dan Gable Museum. What’s special about Gotch’s lounge chair is that I have had six Olympic champions sit in it, including Dan Gable, and many old professional champions, like Lou Thesz, Dan Hodge, Verne Gagne and Bob Geigel. WS: When did you first meet Dan Gable? MC: When I came out of the Navy, Dan was a senior in high school. I saw him wrestle once in high school, and his approach to wrestling was like nothing I had ever seen. It was interesting to watch him even warming up. The next year, he won the Midlands as a freshman, and had everyone there talking about him and his dedication to the sport. What impressed me the most is how he got people so excited about wrestling. WS: What do you consider to be the most spectacular stretch of Gable’s career? MC: Gable hit a peak in 1971 and 1972 that in my opinion has never been matched by an American. He was so far ahead of everyone around him in terms of training and dedication. In the 1971 World Wrestling Championships, Gable pinned a great Japanese wrestler who was considered unbeatable by many experts, and Dan went on to win the gold medal. That night at the banquet, everyone wanted to see Gable but his coach, Bill Farrell, said he couldn’t get him to come because he went on a 10-mile run to train for the Olympics, which was a year away! At the 1972 Olympic regional trials held in Iowa City, Gable pinned all six opponents and outscored them 121–0. I was covering the tournament and asked to present him his outstanding wrestler award but couldn’t find him because he was in the sauna working out. From there he went to the final trials in Minnesota and outscored his opponents 78–1 and then went on to win the Olympics without giving up a point in six matches. So in his last 19 matches against the best wrestlers in America and the world, he gave up one point. That is incredible! WS: You worked out with Gable as he was training for the Olympics. What was that like? MC: It was just briefly a couple of times, when he couldn’t find anyone else to work out with and I was available. He weighed 150 pounds and I was 205 pounds and could bench press over 400 pounds at the time, but he could control me easily. The thing about Dan was that he was impossible to get out position, and the minute you touched him you were off balance. He would always push and pull you and the pressure was relentless. Like a good friend of mine, Jim Duschen, always said, “If you never wrestled Gable back then, it’s impossible to understand what it was like.” Jim was an All-American at 190 pounds for Iowa State when Gable was there and went on to win two national titles in Greco-Roman at 220 pounds. John and Ben Peterson will tell you the same thing, and they won Olympic gold at 180.5 and 198, respectively. WS: You’ve always been big into working out and weightlifting, right? MC: Yes. I started lifting weights in high school when no one else was doing it. I fell in love with it and have continued for 55 years non-stop. I love the solitude of being in a weight room alone and the muscle pain that comes with hard training. The longest I have ever gone without working out with weights was when I cut my finger off and couldn’t lift for three weeks. Today I am 71 years old and I still work out with cardio and weights 6 days a week, and sometimes 7. I am currently on a 21-day streak of working out every day. I view working out as an investment in yourself, your health, and well being, both physically and mentally. WS: What do you view as your greatest contribution to the sport? MC: I’ve spent a great deal of time and effort the past 40 years trying to promote and market wrestling. The problem with wrestling is that its history and heroes aren’t well known. Hardly anyone in the state of Iowa knows who John Smith is, and I was recently with a group of high school students who didn’t even know who Cael Sanderson was. I’ve tried to change this by creating the International Wrestling Museum, WIN Magazine, the Hodge Trophy, and the WIN memorabilia show, but what I am most proud of is the 16 books I’ve written about wrestling, all of which are in the Library of Congress. What’s been most rewarding is hearing from the readers of these books and getting orders from people who were so inspired by what they read that they want to give the books as gifts. Hardly a day goes by when we don’t get a call or email from someone around the world who wants to buy one of my books. Just last week, I did three radio interviews — one by a host in England, who wanted to talk about the Gotch-Hackenschmidt matches on a London radio station. Imagine that! WS: How could our readers go about ordering any of your books? MC: They can order them by calling 641–791–3072. Or they can check my web site at www.mike-chapman.com. We have an ad in every issuer of WIN Magazine, too. WS: Last question, what would be your advice to a young wrestler interested in learning more about the history of wrestling? MC: It’s simple: read books. Pick up a book and read it. That’s what I always tell people, because books transport you back in time to any place you want to go. One of my favorite books I have written is called “Achilles: Son of Peleus, Scourge of Troy”, about the greatest warrior in world history. Achilles lived 3000 years ago and was a wrestler, a fact that I include in the book. Merely picking up the book and reading it transports people through time. Just recently, Mark Schultz posted a note on Amazon saying how much he liked my book on Achilles. That was a real honor for me, to have an endorsement from Mark! Or a young wrestler can pick up any of my three books on Frank Gotch to find out what wrestling was like in the early 1900s. WS: Thank you so much making time to speak with us. It has been a pleasure. MC: You are very welcome. I enjoyed it. When working in his den in Newton, Iowa, Mike Chapman often sits at this white wicker table that was once owned by Frank Gotch, world heavyweight wrestling champion from 1908 to 1915. 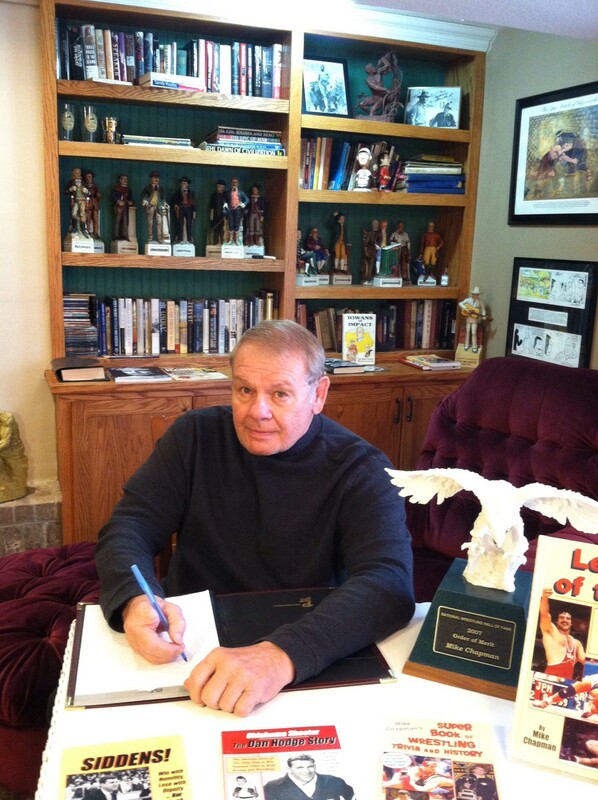 Visible on the table are several of Mike’s books, and the white eagle Order of Merit statue given to him by the National Wrestling Hall of Fame in 2007. Behind him is the burgundy lounge chair also once owned by Frank Gotch.